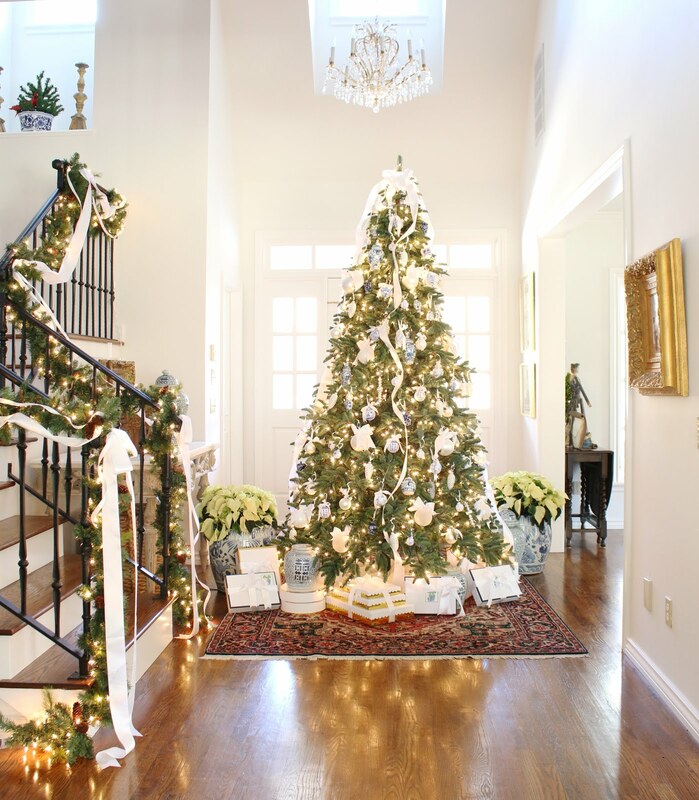 to bring you ideas on how to use these gorgeous flocked Clifton Pine trees in and around your home. See how I used two trees to flank my door and set the tone for the decor inside. My love for blue and white inspired me to use flocked trees for my outdoor Christmas decor this year. I love the simple look of the white, flocked trees. They look so natural. The flocking is light enough to allow the life-like branches peek through. Placing the trees in these pots makes them stand out on their own, don't you think? On snowy days in Oklahoma, my four boys love to bundle up in their winter clothes (think A Christmas Story) and head outdoors. They sled, make snowmen, and play outside until they are sopping wet and frozen. Then, they come in, dumping their wet clothes right inside the door. We warm up with hot chocolate and a fire. I keep this clothes drying rack next to the back door. While they are warming up, I hang all the wet coats, mittens, socks, pants, shirts, etc. to dry. This has worked like a charm and saved me from running the dryer all day, every day. The rack folds up and goes right into the closet after I'm finished using it. We also play lots of games and build forts. Winter is a great time to reconnect with each other. Ever since we gave up cable 8 years ago, we have been learning how to fill our days and time without television. There might be a little more togetherness then we like, but I think we will survive. If you ask the boys, you might get a different answer. HA! How do you connect with your family during the long, cold winter? Some of our favorite Christmas traditions are decorating gingerbread houses together, painting our own ornaments to give as teacher gifts, shopping for other's wish lists, reading a book aloud, caroling around the neighborhood with friends, drawing names and shopping for each other, decorating the tree, worshipping together on Christmas eve, and reading this precious Christmas story on Christmas morning. 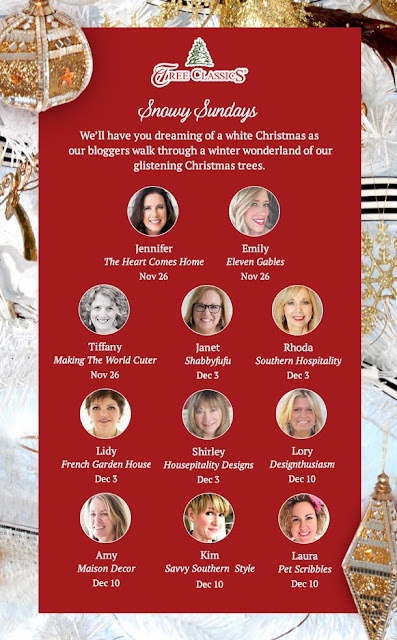 Thank you, Tree Classics, for including me in your Snowy Sundays campaign. You can see my Tree Classics Deluxe Noble Fir tree from 2016 HERE in more detail. Oh, and guess what?! I already changed up my porch the day after I took these photos. Go see what I'm talking about and follow me for daily updates around my house HERE. it looks beautiful, emily! i always love seeing your exterior, and those trees complement it perfectly! Looks stunning Emily! I love them outdoors in the big pots. Great idea~! Oh Emily...the trees are spectacular and how grand they look flanking your doors. The porch truly sings with the joys of Christmas and great idea about the drying rack...can't imagine how the snowy days are with the boys...sounds like so much fun with lots of memory making!!! Emily, how beautiful your front entrance looks!! I love the trees flanking the door! What a warm welcome it extends to family and friends visiting for the holidays! Beautiful! Who wouldn't enjoy stepping inside your home with such an inviting Christmas welcome on the outside?! Thank you for sharing. Do you mind sharing where the lovely decorative white boxes came from? So pretty. So beautiful! I'd love to do that to my home, but we live in the hood - all would be stolen overnight! I'll just enjoy yours! The trees flanking the door are stunning! I love them in the chinoiserie pots and I’m crazy about the flocked trees!! It’s such a great, elegant look!